Promoters Alan Kreitzer and Don Leiby knew, at some point, there would have to be a succession plan put in place at Lincoln Speedway. Both Kreitzer and Leiby have been at the successful speedway for over two decades. They still enjoy the promoting game and have the experience to carry on for years to come, but neither is getting any younger. So, when the opportunity presented itself to form an exit strategy and sell the speedway to new partners, it was a no brainer. It guaranteed the future of Lincoln Speedway is in good hands. Kreitzer will remain involved at Lincoln. He will be partnered with the management team of Scott Gobrecht, Jerry Parrish, and Mike Heffner. Leiby has sold all of his shares at the speedway. “Well, we’ve done it for 26 years, and I think it’s likely in the next five years that we would be doing something,” Kreitzer said. “This opportunity presented itself, so it seemed like a good fit for all concerned. This deal morphed out of a simple phone call from Parrish, who owns the Sprint Car driven by Brian Montieth, to Leiby. It got the ball rolling on what turned out to be a long offseason process. Gobrecht, owner of BAPS Motor Speedway and part owner of a Sprint Car team, entered the mix a short time later. Like Parrish, he is well respected in racing and as a businessman in the Hanover, Pa., area. Not only are Gobrecht and Parrish successful businessman, they are friends. So, it only made sense that they would partner with each other in this venture. Parrish and Gobrecht put an offer in to Leiby and Kreitzer, but there was another interested buyer in the mix. Heffner, who is part of the management team with Kreitzer at Selinsgrove Speedway and also owns a team, entered the picture late in the game. So instead of going one direction or the other, the parties met and decided to make it four-person group of heavy hitters in the central Pennsylvania area. Parrish will run the day-to-day operations at the speedway. Kreitzer will also be in the mix, with Gobrecht and Heffner also having input. “It’s not like there is anyone in there who doesn’t know racing,” Kreitzer said. “I’ve worked with Mike the last three years at Selinsgrove, so I have a pretty good understanding of what he’s all about and his philosophy. “He really has the best interest of racing at heart with the decisions he’s made. I think he will be a welcomed edition to the team and be a real asset. 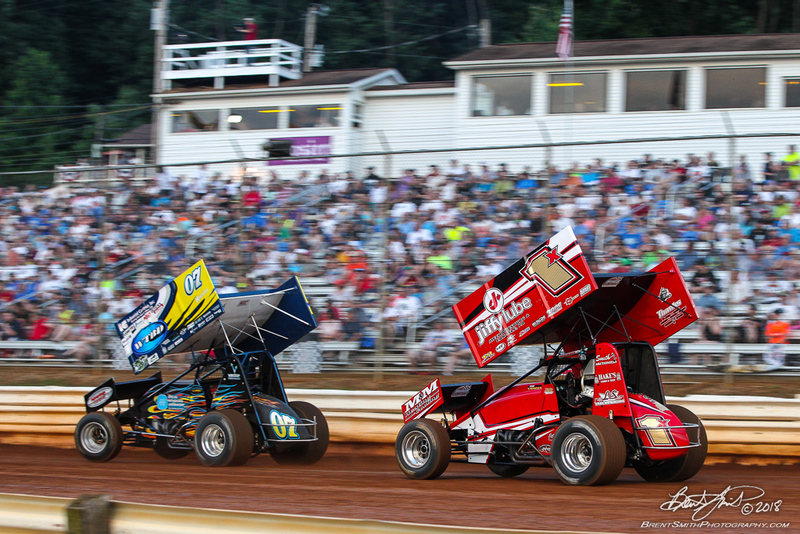 For Gobrecht and Parrish, being a part of Lincoln Speedway, a track close to their hearts, is a dream come true. Gobrecht remembers growing up at the speedway. His parents worked in the refreshment stand, and he, along with his brothers, used to drive their big wheels and go-karts at the speedway. “It goes back to Lincoln Speedway renaming its Speed Week date the Kevin Gobrecht Memorial,” Gobrecht said. “We are coming up on the 20th anniversary of that in 2019, and one of the most special things for me was when the Legend cars were added to the event, and I was able to win it. “That was a very, very emotional night for me. I have a collage of pictures hanging on my office wall, and one of those pictures is Jerry and I standing in Victory Lane. The relationship with Parrish only adds to this moment for Gobrecht. The two forged a friendship when their businesses were in their infancy stage, and there is a deep mutual respect that has withstood time. Now, Gobrecht and Parrish get to work with each other at Lincoln. And they get to do it with two partners who know the racing game inside and out. “Being involved at Lincoln will not take away from what I do at BAPS,” Gobrecht said. “The team I have at BAPS and the success of that speedway is also very important to me moving forward. “Jerry is one of my oldest and best friends. I’ve always had lot of respect for the way he does business, and more important, how he works with people and understands different personalities.